Task status "Inactive" shows that the task was scheduled. No further proceedings have been taken by now. Task with status "Ready" is assigned to a particular resource or group of resources and is pending for the assignment approval. If the assigned resource(s) accepted the assignment the task is marked with status "Assigned". If the assigned resource rejected the task assignment, the task status is set back to "Ready’ status. Sometimes tasks with status "Ready" can be deferred or timed out and no action is taken to go along with the task. If so, you can change the task status from "Ready" to "Expired" (see below). 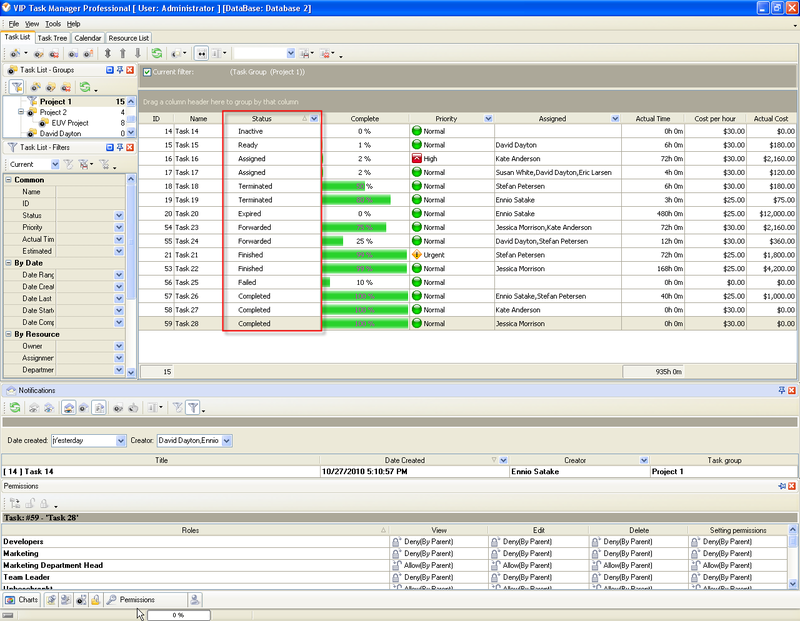 Task Status "Assigned" shows that the assigned resource accepted the allocation of the task and is ready to proceed with it. If the task follows a series of steps or events and one of task stages was completed the task is labeled as "Terminated". Task Status "Expired" shows that finish date, due date elapsed or there is no need in this task any more because the targets or requirements have changed. If there are several allocations for the same task and one of the assigned resources has performed his part of work on the task, he can change the task status to "Forwarded". Task Status "Finished" shows that all steps were completed and that task is waiting for being completely accomplished. Task Status "Failed" notifies about some problems, undesired events or irrecoverable errors which occur during task accomplishment. Task Status "Completed" is displayed for successfully accomplished tasks. In Name field enter custom field name, for example, "Workflow 26". Click "Ins" button, enter the status name "Assigned" in Name field and click "Ok" button. Click "Ins" button, enter the status name "Terminated" in Name field and click "Ok" button. Click "Ins" button, enter the status name "Expired" in Name field and click "Ok" button. Click "Ins" button, enter the status name "Forwarded" in Name field and click "Ok" button. Click "Ins" button, enter the status name "Finished" in Name field and click "Ok" button.